The “Hercules 2.0” features our revolutionary Bio-Glide™ technology for extremely smooth pan and tilt movement and spring assisted drag control. Tilt can be pin locked, so the “Hercules 2.0” functions as a Fluid Swivel™. Also has a positionable handle, built-in bullseye level and the Kessler Lifetime Warranty. Utilizing our Bio-Glide™ technology and unrivaled 150 lbs weight capacity, the “Hercules 2.0” out performs the normal fluid heads, but still maintains an affordable price tag. See the K-Pod™ Packages page, for various bundle options, that include the Hercules 2.0 head and K-Pod System™ tripod. *Optional Quick Plate to mount a camera is not included, and must be purchased separately, if needed. 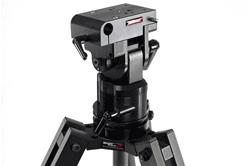 Can I mount the Hercules 2.0 Head to my non-Kessler tripod legs? *With its 100mm levelable ball, the Hercules 2.0 Head can be mounted to tripod legs with a 100mm bowl. *With its 75mm fixed ring mount, the Hercules 2.0 Head can be mounted to tripod legs with a 75mm bowl. The leveling will need to be done with the tripod legs. The reason being is that a 75mm ball/bowl system does not have enough surface area to accommodate the clamping force of heavier rigs such as a slider. – Bio-Glide™ technology for pan / tilt movement that is smoother than a typical “fluid” head. – Locking pan & tilt drag control. – Vertical pin lock. Locks out vertical tilt, so head can be used like a Fluid Swivel™. – Mounts to tripod with 100mm ball or 75mm ring. – Optional quick plate available for direct camera to head mounting.